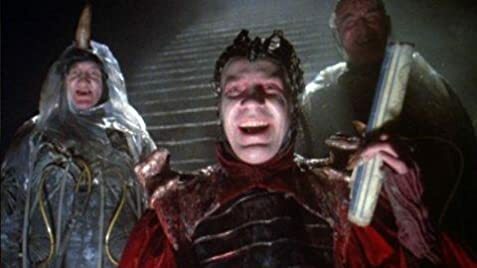 Craziest Feature-Length Terry Gilliam Film? A young peasant, with no interest in adventure or fortune, is mistaken as the kingdom's only hope when a horrible monster threatens the countryside. Announcer: Yes, folks... Moderna Designs present the latest in kitchen luxury. The Moderna Wonder Major All Automatic Convenience Center-ette gives you all the time in the world to do the things you really want to do... An infrared freezer-oven complex that can make you a meal from packet to plate in 15 1/2 seconds. Kevin's Mother: Morrisons have got one that can do that in eight seconds. Kevin's Mother: Block of ice to Beef Bourguignon in eight seconds. Lucky things. Q: Was Kevin experience real or did he dream it? Q: [1:21:41]Why did Evil (David Warner) trap the dwarves in cages instead of just destroying them? Young Kevin lives in suburbia with his parents. They focus on the telly and quiet while he gets excited about history and learning. His world changes totally when he wakes to find four men have come out of his wardrobe. They start pushing one of his walls away and, when a powerful force comes out after them, Kevin flees with them. He learns the time are time travellers who have stolen a map of the holes in the galaxy from their former employer, The Supreme Being. 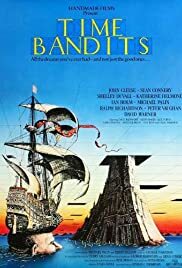 Far from being a perfect film, Time Bandits is still a wonderfully fun fantasy for the family (although perhaps not younger children) which is also notable for not really having dated at all in its 25 years. The plot starts from nowhere and jumps around in various adventures in different times (real and fantasy) with a vague plot to hold it together. The narrative flows well in some regards but it is hard not to notice that at times it is very much like a collection of ideas and sketches rather than a strong plot. What keeps the flow though is the sense of fun and imagination that runs through it  things that I think owe a lot to Gilliam's roles as director and co-writer. He fills the film with a consistent sense of wonder which is well propped up by many great shots and atmospheric scenes. It does well to mix comedy with the more serious fantasy stuff and does provide something that children and adults will like (although both will occasionally feel the effects of the film being a bit piecemeal). The principle cast are pretty enjoyable with the bandits themselves being a fun ragtag of Baker, Rappaport, Edmonds, Dixon, Purvis and Ross. Far from being a modern annoying brat actor, Warnock is actually really good and he holds the essential "English-ness" of the film throughout. Of course, given the fragmented nature of the film means that a lot rest on the cameos which include nice turns from Palin, a wonderfully polite Cleese and solid characters from Holm, Connery, Duvall, Warner, Broadbent and others all giving good performances in their respective roles. Overall then an enjoyable family fantasy that has all the strengths and weaknesses that you should expect from Gilliam. Structure wise it is a bit all over the place and does occasionally feel like a collection of separate ideas and sketches it does have a great sense of fun and wonder about it.